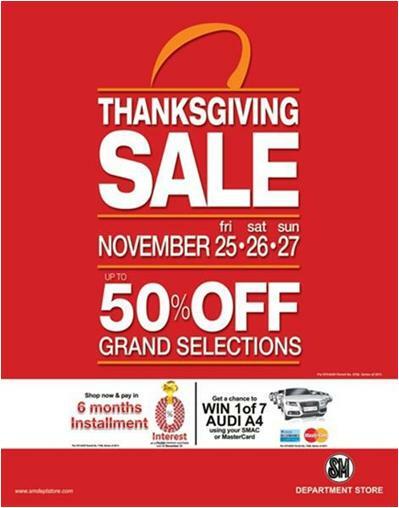 SM Department Store Thanksgiving Sale from on November 25-27, 2011. Enjoy up to 50% discount on selected items. Get the chance to win one of 7 Audi A4 when you shop with your SM Advantage Card or Mastercard. Shop and pay in 6 months installment at 0% interest, for P5,000 minimum purchase until December 31, 2011. Happening at all SM Department Stores nationwide.